#OPEN TEXTBOOK tweet Book01 | THiNKaha: Become a recognized expert in your field of expertise. Compelling thought leadership content. Section 1: What is Open? Section 2: Why Author an Open Textbook? Section 3: Why Adopt an Open Textbook? Section 5: Why Should Your College or University Care? Section 6: How Does the Student Benefit? Section 7: Where Are We Headed? Textbook prices routinely cause sticker shock. Over the last decade, they have risen more steeply than the inflation rate and, in last year, the average textbook cost a student $62.97! While estimating the cost of a college education, today’s college student needs to factor in several thousand dollars just for textbooks. Debate rages over the astronomical prices of college textbooks, and includes scrutiny of the practices of the textbook publishing industry. Powerful initiatives, including legislative solutions, have been proposed. In fact, the State of Maryland even passed the College Textbook Competition and Affordability Act of 2009. Some of the strongest movements to make textbooks accessible and affordable are open textbook initiatives, such as the Open Textbooks and Community College Consortium at collegeopentextbooks.org. An open textbook is one that is accessible to all. Not only is it freely available for use but educators can modify, localize or update it to suit the particular needs of their students. The ease of access and customization of open textbooks has spurred tremendous interest among professors and educationists and the demand for affordable, up-to-date textbooks is changing the landscape of how learning content is being delivered. This in turn has fueled a growing trend for open textbook adoption. Through appropriate licensing deals, authors can now offer content that remains current and can be remixed or shared, and thereby extend the reach of their textbooks to a wider, newer, more empowered audience. 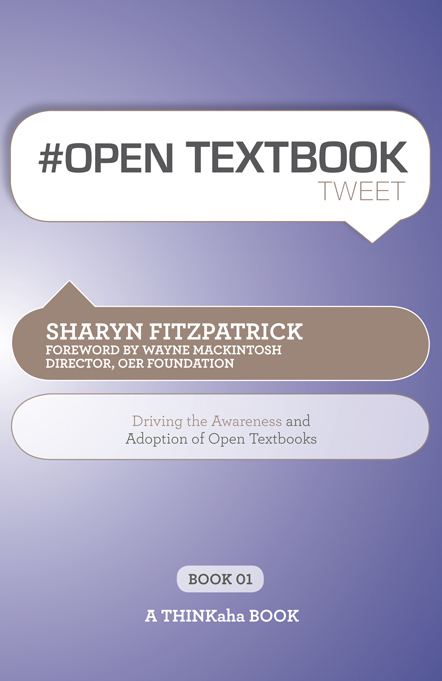 In ‘#OPEN TEXTBOOK tweet Book01,’ written in the popular tweet format, Sharyn Fitzpatrick, shares with you the value of open textbooks and shows authors how to benefit from the growing demand for them. Best practices on why and how open textbooks should be adopted for today’s classrooms are covered. Educators and faculty members will discover how to drive awareness and adoption of open textbooks at their own colleges. In the easy, accessible, readable style that has become the hallmark of THiNKaha books, ‘#OPEN TEXTBOOK tweet Book01’ shows authors and educators how they can participate in this win-win effort and seize this opportunity to contribute positively towards ensuring open, affordable college learning for all. ‘#OPEN TEXTBOOKS tweet Book01’ is part of the THiNKaha series whose 100-page books contain 140 well-thought-out quotes (tweets/ahas). Please pick up a CC by SA version of this book for free at Wiki Educator. Sharyn Fitzpatrick has over 25 years experience in sales and marketing including executive positions with The Learning Company, Knight-Ridder and Sum-Total Systems as well as principal of Marcom Gurus, a high-tech agency she founded in 2000. Her love for education has continued with her taking a leadership role on the College Open Textbooks marketing team.